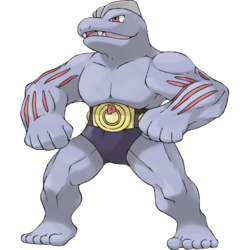 Machoke in game: 2,062 Who? Important notice! Pokemon Machoke is a fictional character of humans. Machoke is a bipedal, humanoid Pokémon covered in gray skin. It has a vaguely reptilian face with a short snout, narrow red eyes, and four pointed teeth visible inside its mouth. Two of these teeth are in the upper jaw, while two are in the lower jaw. On top of its head are three, light brown ridges. Its arms are muscular with dark red, vertical stripes on them. It possesses large pectoral muscles that protrude slightly over its belt. The lower part of its body has black markings that resemble briefs. 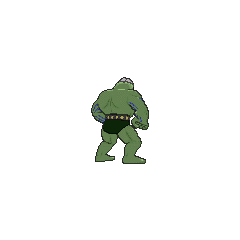 It is always seen wearing a black and golden power-save belt resembling a Championship belt that regulates Machoke's strength. Machoke is a Pokémon of immense strength. Its muscles are as hard as steel, and it is capable of lifting extremely heavy objects with only one finger. In spite of this, it is modest and often helps people with manual labor. It can be found in the mountains, where it trains daily. Two Machoke were present on the expedition crew in Shell Shock!. They rescued Ash, Misty, Tracey and the crew from a runaway boulder heading for them. In Turning Over A New Bayleef, one owned by Harunohelped her with her gardening. Chuck used a Machoke for the Gym Battle in Machoke, Machoke Man. Chuck's Machoke was defeated by Ash's Bayleef. A Machoke appeared with a Machop in Pop Goes The Sneasel. These Pokémon were protecting the flame of Ho-Oh both with a Sneasel. A Machoke was used by the captain in Hoenn Alone!. Several Machoke and Machamp appeared in Bibarel Gnaws Best! as construction workers. Maylene also owns a Machoke which appeared in Lost Leader Strategy!. Kenny used a Machoke in the Performance Stage of the Sandalstraw Contest in Old Rivals, New Tricks!. A Machoke appeared in Showdown at the Shalour Gym! under the ownership of Korrina. Machoke has had many appearances, many more than its evolved and pre-evolved forms. It can usually be seen in Dojos and on construction sites. Machoke made its debut in The Punchy Pokémon where it fought against Ash's Primeape. Machoke also appeared in The March of the Exeggutor Squad. A Machoke appeared in Princess vs. Princess competing in the Queen of the Princess Festival contest. 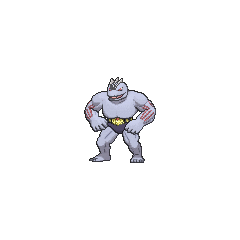 A Machoke was seen in a Pokémon Lab in Riddle Me This. A Machoke under the ownership of Stella appeared in It's Mr. Mime Time. Danny owned a Machoke in Navel Maneuvers, which helped him carve a sled in order to compete with it. It reappeared in a flashback in Hello, Pummelo!. Machoke also appeared in the second original series movie, The Power of One. A Machoke was seen in a dojo in Wired for Battle!. A Machoke was one of the Pokémon seen at the Pokémon Swap Meet in Tricks of the Trade. Trixie has a Machoke which is used in a circus in Love, Totodile Style. Dr. Anna owns a Machoke which she uses in her health clinic for massages in Hassle in the Castle. A Machoke appeared in Beauty and the Breeder where it participated in a Pokémon breeding competition. A Machoke appeared in A Better Pill to Swallow as a fantasized Pokémon. Wobbu-Palooza! featured a Machoke belonging to a Festival Crasher. A Machoke was part of a Pokémon street festival in Doin' What Comes Natu-rally. A Machoke was one of the Pokémon defeated by Wings Alexander's then Hoothoot as seen in his flashback in Throwing in the Noctowl. A Machoke was seen training alongside its Trainer in You're a Star, Larvitar!. A Machoke made an appearance in We're No Angels! and in the opening of Destiny Deoxys. A Machoke was also owned by a demolition crew (which was changed into a construction crew due to Ritchie changing the past) in Celebi and Joy!. It was revealed in Lost Leader Strategy! that Maylene had a Machoke that was used in a Gym battle against Paul and in A Triple Fighting Chance! wherein Machoke was defeated by Ash's Staravia. A Trainer's Machoke appeared in A Marathon Rivalry! participating in the Pokéathlon held in Camellia Town. A Trainer's Machoke appeared in The Guardian's Challenge!. A Trainer's Machoke appeared in SM004. 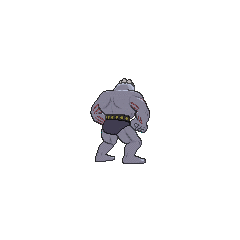 A Trainer's Machoke appeared in SM013, where it participated in the Pancake Race. DP068 Machoke Dawn's Pokédex Machoke, the Superpower Pokémon. 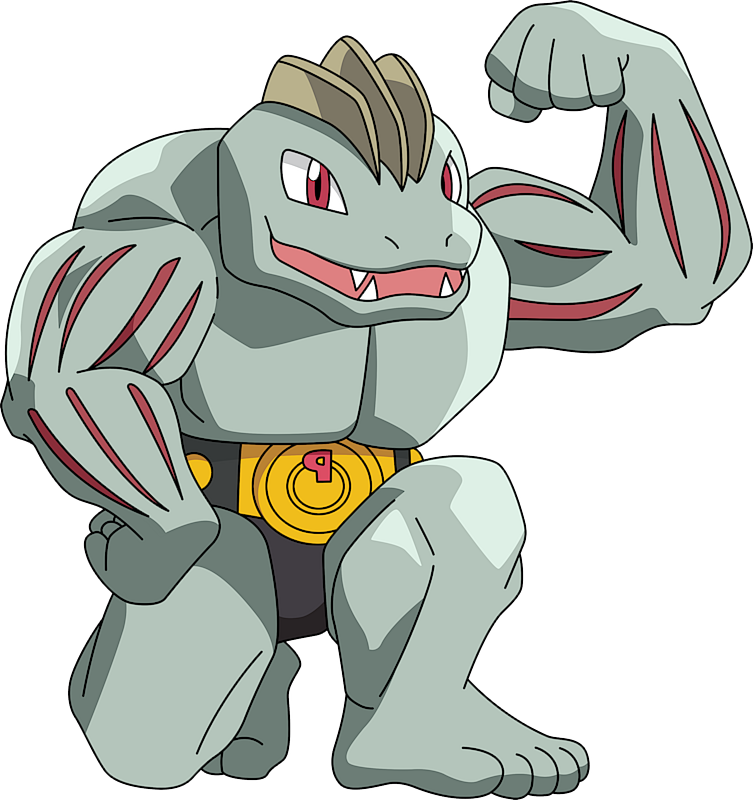 With enough strength to lift a giant truck with one hand, Machoke are often used to extremely heavy work. Machoke debuts in its own round, Bulbasaur, Come Home!. Here, it protected the Viridian Gym from intruders, attacking Red and Professor Oak, but Bulbasaur defeated it with a SolarBeam. Blue also had a Machoke that evolved into Machamp under Red's care, but was traded back afterwards in A Tale of Ninetales. 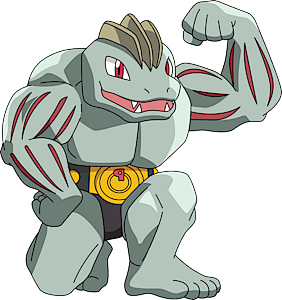 Machoke was seen again in Volume 18 as one of Brawly's Pokémon; it is unconfirmed if this Machoke evolved from the Machop he had in Volume 16. Machoke attempted to fight Blaise's fiery illusions in Volume 20 at the Lilycove Museum, but failed miserably and ended up getting burned. His Hariyama succeeded in doing so, however. Three Machoke were helping X's family move into their new home in Vaniville Town in the X & Y chapter. A Galactic Grunt uses a Machoke in Find Munchlax!!. Maylene has a Machoke which was only seen getting defeated by Hareta's Piplup.